Anyone who has been to our hospital recognizes it right away. It is circular. If you are driving from the east into Columbus on interstate 70, it rises up in front of you like a giant cylinder on the horizon. Each nursing unit is round and the patient rooms are all on the outside, like slices of a gigantic pie. 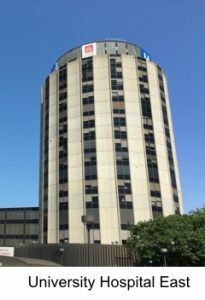 OSU East’s tower had a (nearly identical) twin sister building in Columbus, the Christopher Inn which was designed by African-American architect, Leon Ransom and was built by the Elford building company in 1963. For 25 years, it was Columbus’s premier downtown hotel and local famed jazz musician, Bob Allen and his trio played in the bar nightly. On our wedding night in 1983, my wife and I stayed at the Christopher Inn and I vividly remember the two of us walking down the curved stairs to the bar with her wedding dress flowing down the stairs behind her with Bob Allen playing a jazz song. 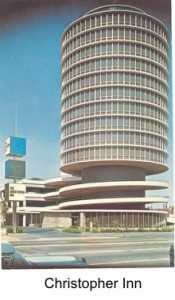 Sadly, The Christopher Inn was demolished in 1988 – although ultramodern in the 1960’s, by 25 years later, it was dated and out of style. 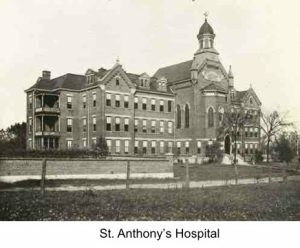 Ohio State University Hospital East first opened as St. Anthony’s Hospital in 1891, built and operated by the Sisters of the Poor of St. Francis. In the 1969, St. Anthony’s Hospital opened its new tower building, also designed by Leon Ransom and constructed by the Elford company. When the Sisters of the Poor worked with Ransom to draw up the initial architectural plans for their new hospital tower, the Sisters wanted to do something really innovative, namely, make all of the rooms private. Up until that time, the industry standard was semi-private hospital rooms. These were rooms with 2 patients, generally separated by a pull-back curtain. Hospitals contained mostly semi-private rooms with a few “VIP rooms” that were private for only one occupant. Part of the reason for the semi-private rooms was that insurance companies would only pay for a semi-private room since a private room was considered an unnecessary luxury at the time. But the Sisters really, really wanted to have all private rooms. In that sense, they were innovative and quite forward-thinking. The problem was, when they went to Blue Cross with their plans, the insurance company said that it would not pay for private rooms, only semi-private rooms as was their standard practice for inpatient coverage throughout the country. So, after a lot of negotiation, the Sisters struck a deal with Blue Cross. The hospital would be allowed to have all private rooms but they would have to be exactly 1/2 the size of a standard semi-private room. In exchange, Blue Cross would pay semi-private room rates for inpatients admitted to the hospital. 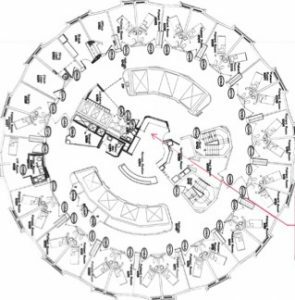 Now, we have circular nursing units that have about 30 patient rooms per floor, each room being half the size of a normal semi-private room at other hospitals. Since 1969, a lot has changed in healthcare and now, the industry standard has moved from semi-private to private rooms. Hospitals are scrambling to convert their old 2 patient rooms into 1 patient rooms. Furthermore, hospital rooms now require more monitoring and medical equipment that takes up space. Also, our patients are bigger than they used to be. In 1960, the average American man weighed 166 pounds but by 2010, the average man weighed 196 pounds. In 1960, the average American woman weighed 140 pounds but by 2010, the average woman weighed 166 pounds. That means that in the past 4 decades, the average man in the United States weighs about 30 pounds more and the average woman weighs 26 pounds more. Bigger people means bigger beds, bigger chairs, and tighter spaces in the rooms designed for the smaller patients of the 1960’s. At the OSU Medical Center, we have several different hospital buildings. Our newest building is the new James Cancer Hospital, a beautiful 21-story building on Ohio State’s campus that opened in 2014. It has the largest private rooms at 314 sq ft. The Ross Heart Hospital (built in 2004) is the second newest building with private rooms at 302 sq ft. Before that was the original James Cancer Hospital building (now the OSU Brain and Spine hospital building) that originally opened in 1990 with private rooms that are 239 sq ft. Rhodes Hall is one of two buildings of the main University Hospital and opened in 1976 with semi-private rooms that have now largely been converted into 224 sq ft private rooms. Doan Hall is the oldest of the OSU Medical Center buildings still in operation and was built in 1951 – its semi-private rooms have been largely converted to private rooms that are 214 sq ft. The nuns were way ahead of their time in demanding that hospitals be made of private patient rooms. But now, 40 years later, there are new demands in hospital rooms and in the future, hospital room construction will require even larger rooms to accommodate even larger American patients, more medical & monitoring equipment, and family members whose expectation is to stay overnight with patients. Additionally, as we have more emphasis on eliminating hospital-acquired infections and utilizing contact/airborne/respiratory/enteric isolation precautions, semi-private rooms will become a curiosity of history and private rooms will be the only kind of U.S. hospital patient rooms.